With so many trends on the runway, it can be difficult to pick and choose which ones to go after this spring, especially for the men out there. So to make that job a little bit easier for the men, you’ll find top trends and how to wear them in this post. That way, more spring and summer days will be spent relaxing rather than stressing about what to wear. The brand we’ve known since our childhood days, Gap, has grown up with us from those colorful sweatshirts with “G A P” boldly placed across the front to the perfectly classic look. The brand is always on top of trends and always classy, so what better way to introduce men’s fashion that someone who works with the iconic brand. Although he’s “not really a fan of the bright colors,” a plaid button down shirt can add a subtle pop of color that is wearable for any guy. 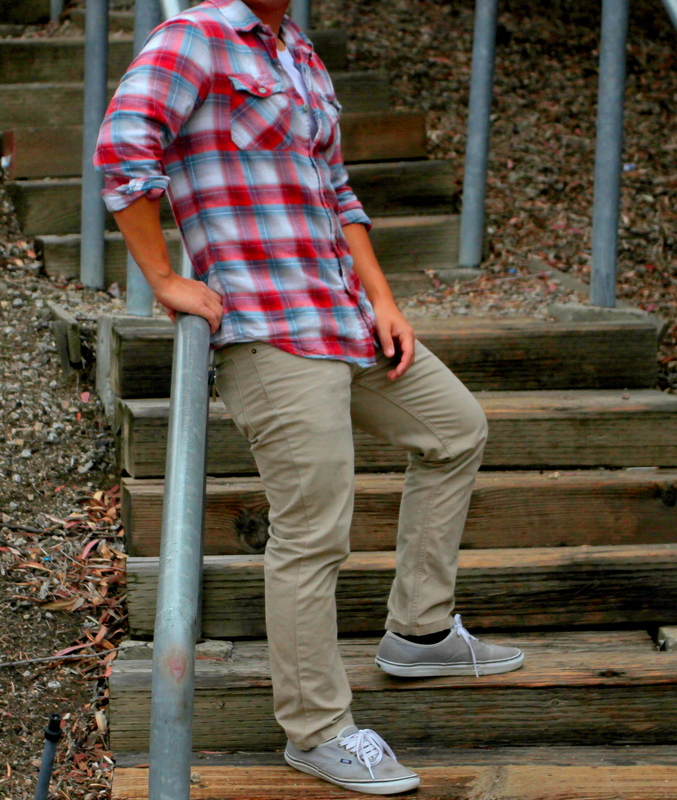 Cal Poly freshman David Jang wearing a subtly bright plaid button-down. Choose colorful button-downs and pair with khakis or jeans. Callie Gisler, a writer for CollegeFashion and the author of her own blog, Coffee and Cardigans, agrees with Daniel on a button-down being a staple item for men this spring, especially for men in college. What else do think of during spring and summer besides flowers? The ocean. Ocean blues made their way into the Spring 2012 runways and they’re making a splash. University of Nevada, Reno freshman Kevin Cleary loves spring. Blues are easy to incorporate into an outfit because it’s such a simple and widely worn color. But for spring, try to stick with blues that make you think of the ocean; bright, pastel, and watercolor blues are perfect. I don’t think that men’s fashion get enough credit and coverage in the blogosphere – this was wonderful reading! Menswear is such an important facet of the fashion world. So glad I was able to lend a little advice – thank you for the interview!